LINVILLE, N.C. — Starting April 1, guests of Grandfather Mountain will notice a slight increase in the cost of adult admission. Admission for adults (ages 13-59) will increase from $20 to $22, while pricing for children (ages 4-12) will remain at $9. Children younger than 4 will continue to receive free admission. The new pricing will be reflected in current adult discounts, although membership to the park’s Bridge Club seasonal pass program will remain the same, as will school group rates. The increase comes during a time of growth for the nonprofit nature park, which draws all of its funding from admission, food and beverage sales, souvenir sales and donations. “Grandfather Mountain has experienced some wonderful expansion and enhancements over the years,” said Jesse Pope, president and executive director of the Grandfather Mountain Stewardship Foundation, the nonprofit organization that owns and operates the Linville, N.C., nature park. Such enhancements include renovation to some of the park’s most popular overlooks and trailheads, as well as the cougar and elk habitats. “We also have some more exciting changes in store,” Pope added. This marks the first time in five years that Grandfather Mountain has seen an increase in its admission pricing. “Because we’re a nonprofit organization, everything we earn from ticket sales goes right back into the mountain, preserving it for generations to come,” said Frank Ruggiero, the stewardship foundation’s director of marketing and communications. 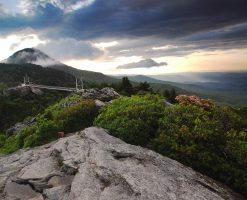 Admission to Grandfather Mountain offers more than a trip to the Mile High Swinging Bridge, however. It also includes access to 12-plus miles of premier alpine hiking in the adjacent Grandfather Mountain State Park; a visit to the park’s environmental wildlife habitats, which are home to resident black bears, cougars, bald eagles, river otters and elk; an educational journey through a Nature Museum, featuring exhibits that spotlight the park’s geologic and natural wonders; documentary screenings in the museum’s auditorium; samples of fresh homemade fudge from the park’s environmentally sustainable Fudge Shop; more than 100 picnic areas, where guests can enjoy a packed lunch or takeout from Mildred’s Grill; regularly scheduled nature programs, animals encounters and habitat keeper talks; and a calendar chockfull of special events. Guests are encouraged to spend at least three hours on the mountain to take in some of the highlights, but Ruggiero said it’s not unusual for visitors to spend a whole day, only to return again that same week for a whole new experience. “Most importantly, a visit to the park helps support the Grandfather Mountain Stewardship Foundation in our goal of inspiring conservation of the natural world,” Ruggiero said.